“A chorus of women’s voices singing the International is heard in the streets of Moscow. 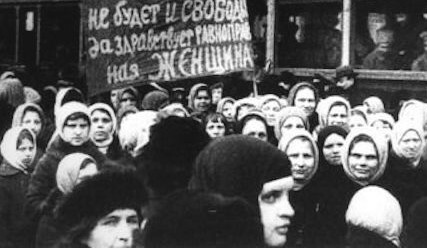 Moscow proletarian women are joyfully marching to the opening of the First International Conference of Communist Women at the Bolshoi Theater. Foreign visitors are also joining in. This is how revolutionary women described the opening of their first conference held in Moscow in July 1920. Twenty-one women representing 19 countries gathered that month to discuss women’s issues in the framework of the Second Congress of the Communist International (or the Comintern). The Comintern had been founded a year earlier, on Vladimir Lenin’s initiative, to replace a (Second) Socialist International which had discredited itself by militarist and nationalist policies during the World War I.
Women’s emancipation had long been an important point of socialist agenda. The Comintern’s program included total equality of rights of men and women in law and practice, integration of women into political life, free education and medical care for women, social measures to ease the burden of housework and childcare, and measures to do away with the sexual double standard for men and women. Communism and feminism: partners, rivals or a unity? Although the studies of the Comintern’s gender policies remain rare, many authoritative voices in western academia have tended to dismiss communist and especially Soviet policies toward women, as “largely inconsequential lip-service.” The same dismissive attitude towards the gains of international communist women’s movement is largely present in scholarly contributions on socialist/communist women’s movements. Liberal feminists of the Cold War era as well as some more recent commentators highlighted that after the World War 2 women’s movements in socialist countries as well as allied international women’s organizations (such as Women’s International Democratic Federation and its American affiliate, the Congress of American Women) mobilized their memberships primarily to serve Party goals rather than mobilize the Party to serve women. The same scholars, by contrast, stressed the autonomous agency and political neutrality supposedly found in Western non-socialist feminist organizations. Socialist feminists in turn have insisted on important shortcomings of classic Marxist theory’s gender agenda: chiefly its inability to incorporate the centrality of the gender division of labour in all spheres and the lack of concern with sexuality and reproduction questions. It has also been argued that attempts so far to interweave socialist feminist critiques of classic Marxist theory and the history of the movements and political entities that tried to bring it into life remain inadequate.